North Carolina Employer Support of the Guard and Reserve, a Department of Defense office, has presented Mickey Truck Bodies’ President & CEO Dean Sink with its Patriot Award for his support of Specialist (SPC) E-4 Jacob Everhart, a Mickey employee on the Van Body Team. 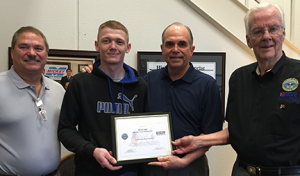 From left: Carl Mickey, Jacob Everhart, Dean Sink and Peter Vanstory, ESGR. ESGR was established in 1972 to “promote cooperation and understanding between Reserve members and their civilian employers, and to assist in the resolution of conflicts arising from an employee’s military commitment.” An employee serving in the National Guard or Reserve may nominate individual supervisors and bosses for a wide-range of support measures including flexible schedules, time off prior to and after deployment, caring for families and granting leaves of absence if needed. Jacob lives in Lexington, NC and has been a member of the National Guard 732nd Forward Support Company (FSC), 5th Battalion, 113th Field Artillery Regiment out of Reidsville, NC since August 2013. His commitment is for 1 weekend of duty every month, including a Saturday, with the potential of extended service to 4 days per month to include a Thursday and Friday – all Mickey work days. In addition Jacob is required to report for a 2-week training exercise every summer.